While not all gardeners may enjoy or participate in the fall ritual of harvesting and saving seeds, it is probably my favorite gardening activity. After actually starting plants from seeds for my garden, seed saving is the gardening activity that makes me feel most like a gardener. I'm amazed that a plant can grow from something that is sometimes the size of the period at the end of a sentence. When harvesting and saving seeds in my garden, visiting other gardens or just walking around my city; I often find a seed or seed pod I collect by placing in my pocket. Seed savers or seed snatchers, if you will, know to carry plastic and paper bags this time of year for the dangling seeds and seed pods that beckon to be collected and saved. Here's how I create pocket seed banks recycling tin mint containers. 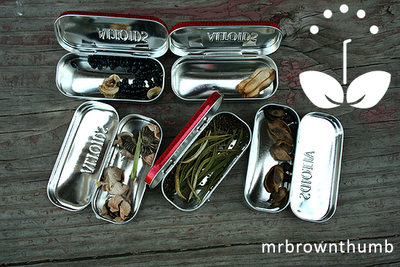 So, what do these mint tins have to do with seed saving? One thing I learned a while back was that those paper and plastic bags we use to store the seeds we harvest aren't always as convenient as they seem. Sometimes they get left in your pockets and end up in the wash, or you throw them away with the other lint and debris that accumulates in your pockets at the end of the day. One day it dawned on me that these empty mint tins are the perfect solution to the aforementioned problem. I call pocket seed banks. 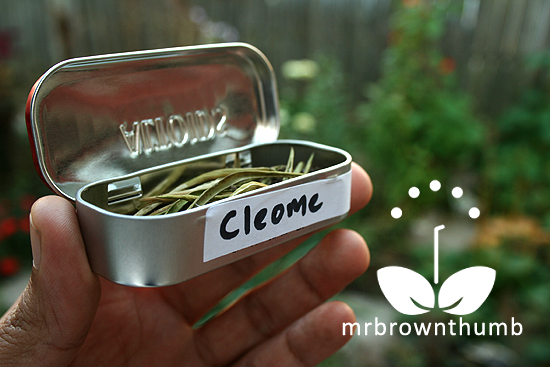 If you've ever harvested and saved cleome seeds you know those pods will readily break open, the tiny seeds spill and if you just placed the pod in your pocket, you now have tons of tiny seeds rolling around your pocket or purse. Inside one of these pocket seed banks the seeds are safe from spilling. The seeds for lilies are easy to harvest and save, but if you've ever placed a lily seed pod in your pocket, backpack or purse you've probably broken the seeds pod. The papery seeds inside are fragile and can quickly turn to dust if you're not careful. In a pocket seed bank the seed pod & seeds are protected from being crushed. Hollyhock seeds while papery aren't as fragile, but hollyhock seed savers know that each one of these seed pods could contain hollyhock weevils. The pocket seed banks are pretty tight and won't allow any weevils to escape into your pocket until you get home and can properly inspect them when you get home. 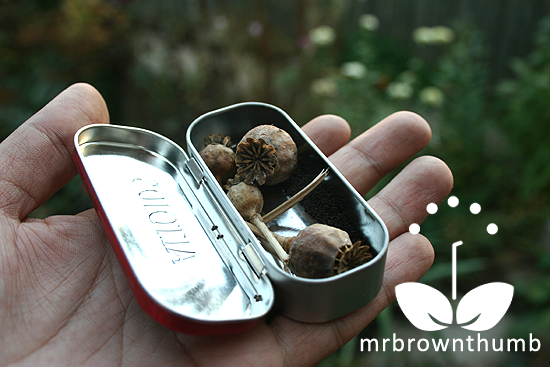 A pocket seed bank is also good for small seeds like those of poppy seeds. A piece of tin is not the easiest thing to write on. I like to adhere a mailing label and write the name of the seeds or seed pod inside. The sticker peels off and allows you to reuse the tin over and over. Here is a picture of some recent seed banks from an excursion into my garden and a walk around the neighborhood. Unlike paper or plastic seed envelopes there isn't much of a chance I'll forget I have a mint tin in my pocket. In the fall I usually carry at least one of these in my pocket at all times to bring back and seeds I come across.The seeds in the top-left are candy lily seeds and the seeds in the lower-right are peony seeds. After arriving home with my latest stash of saved seeds I set them out to dry on a paper towel or plate in a warm location for a few days. Make sure you set your seeds out to dry after harvesting them from the outdoors to prevent them from molding. 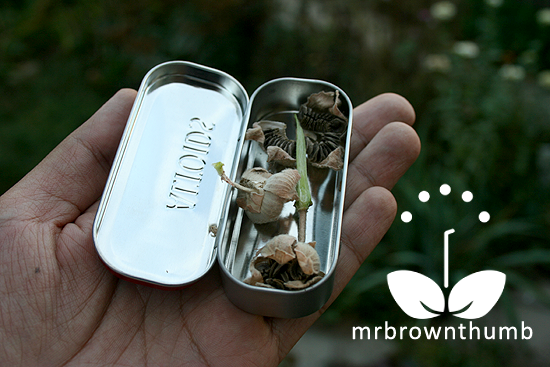 After they're dried you can place your seeds back inside the tins for storage if you like. 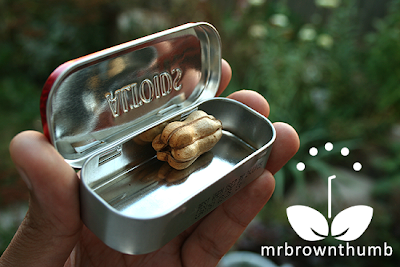 Pocket seed banks, they're a fun and creative way to recycle metal tins and turn them into useful seed saving and storage tools. Put one in your pocket, backpack or purse today. 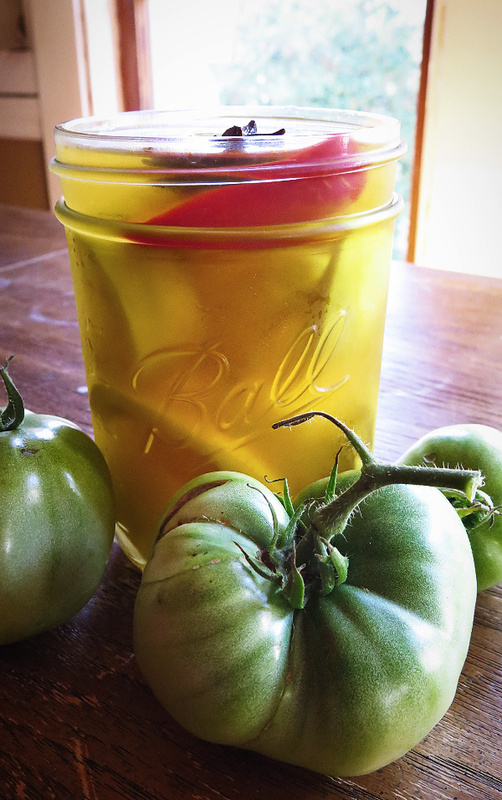 See my post on How to Save Seeds. In it you'll find tips for the beginner gardener who would like to save seeds. Seeds Saving Posts to date on this blog. If you're looking for information on saving or starting seeds in the garden check out the seed snatcher search engine. It is the sister search engine of google for gardeners, and contains hundreds of pages on seed saving and starting information. 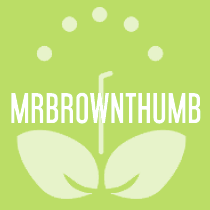 The information ranges from easy to understand seed starting and saving techniques to more academic works on seeds. Neat idea! I don't usually have those tins around but I can see where they would be useful. Once I've collected the seeds I usually store them in baby food jars - we have plenty of them around here! I use tins too, from tins that we get from bakery items etc. Question for you, do you know how to save seeds from BasiL? Our basil plant keeps flowering but I have no idea where you get the seed from. I wish I liked Altoids. I do store my seeds, in individual paper envelopes, in metal boxes similar to these that once held peppermint bark. Booyah! Great idea! These smaller tins are perfect! Thanks for the great idea! @Dave, I've got a couple dozen of them. One day I found two boxes of them (still sealed) and dumped out the mints and kept the tins because I wanted to find a use for them in the garden. I store seeds in baby food jars too, as a way to display them. I like the round tins better because they don't have hinges and openings, but I don't buy those often. @Jennifer, When I get home I usually dry out the seeds and then transfer them to paper for storage and easy seed trades. @MeemsNYC, Yup, big tins are great for storing them at home. I did have a basil seed post planned, but now I can't remember what I did with the pictures for it. If I can't find my pics for the post I'll post a link for you from online on your blog. Ozark Mountain Family, Glad you like the idea. I have one more use for these tins that I'll probably post about later. Thanks for the offer, if I don't get another sample pack I just might take you up on the offer. Great idea. I am just starting out on the saving seeds road. I will check out the links you recommend. Quick question for you-- Where do you store the seeds over the winter? Could you leave them in the little altoid tins? @Gardening in Edgewater, I usually place them in paper envelopes after they've dried out. Once they're dry you can store them in just about anything that keeps water out. Some people store them in containers (jars) inside the fridge, other people place the seed packs in jars in places that are cool and dry. As long as the area that you store them in doesn't have crazy temperature and humidity fluctuations you should be fine. @Tyra, I removed your comment because you placed a link in the comment to your blog and that link was broken and it just looped back into my blog giving an error. Well, this is very clever and it is indeed recycling or repurposing with whimsy. Clever! I love using tins for seeds! 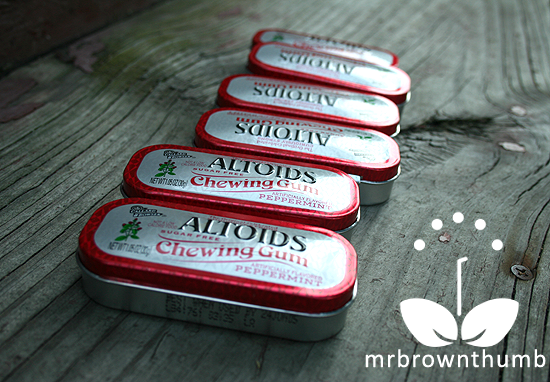 It would be nice if there were inexpensive tins made just for this purpose, but your idea of using Altoids tins is very clever! Those travel aspirin tins are good, too, for smaller seeds. Meemsnyc - your cat is precious. I get frequent migraines, so I always have one of those travel-size bottles of Tylenol or Advil in my purse. When they're empty, those are also great for using as seed banks. Super idea. Every year I want to harvest a few seeds and I never do it. Maybe.... next year! This is one great way to re-cycle small containers. These tin containers look cool as well. Thanks MBT! Gorgeous shapes, photos, and idea. Gotta say, I was really bummed when Altoids ditched their flat-topped tin for their newer, "Altoids"-in-relief design. It was fun to make mini-collages on the top, and would really be perfect for these seed containers as well. I do love saving seeds as well, usually for flowers that I want to grow again in the garden and for veggies. Great idea using the saved containers, I have brown envelopes that I use. I always have a few in purse for collecting seeds while I'm out and about. I use those little mailing labels for everything, freezer containers, seed packets, jars, etc. Phyte club katie, Yeah I'm not much of a fan of these relief ones. 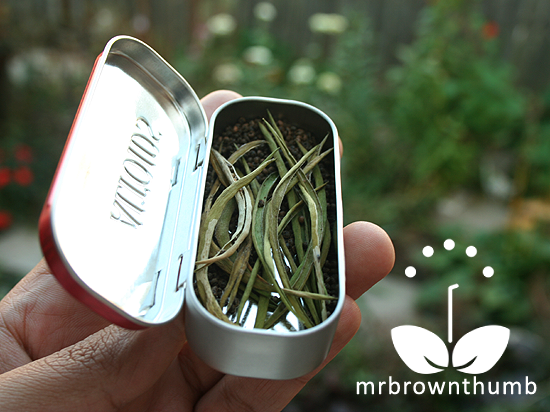 I like my tins to be flat. Chiots Run, thanks for stopping by and sharing your seed saving tips.